Even solopreneurs need a marketing strategy to make sure that they can get the most out of their online business. Without a plan to promote and advertise your business, you’ll have no way to connect with your audience, drive traffic, or convert leads into sales. Of course, marketing isn’t easy. If you want to get the best results as quickly as possible, then you might need some help – particularly if you’re the only person in your marketing team. The good news is that you don’t need to invest in a full advertising department to start generating attention for your online enterprise. Instead, all you need to do is explore some of the most popular and productive tools on the web today. 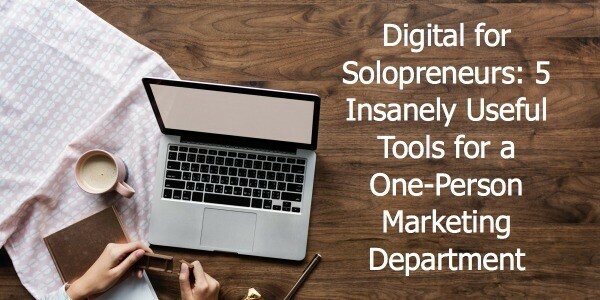 From systems that allow you to send out highly-personalized email marketing campaigns at the click of a button, to analytics packages that prove the ROI of your business, here are 5tools your one-person marketing department must have. It’s easy to assume that social media is the ultimate way to connect with your audience these days. After all, their blogs and articles about the power of social media all over the web. However, just because launching a profile on Instagram, Twitter or Facebook can be good for your business, doesn’t mean you should overlook the original form of customer outreach: email marketing. Email is the third most influential information source online for B2B audiences, ranked behind industry-specific thought leaders and colleague recommendations. Of course, you’re going to need to create professional-looking and personalized emails to your customers if you want to get the best results. Since you don’t have the time to design and write dozens of great emails every day, why not make the process simpler with MailChimp? MailChimp has more than 12 million customers, and it’s packed full of features to help you boost your campaigns, from templates to automated scheduling and more. What’s more, since you’re unlikely to have more than 2,000 subscribers when you’re just starting your business, you’ll probably be able to get by with the free tier. If you’re looking for a tool that can take as much of the stress out of online marketing as possible, then HubSpot could be the answer for you. The system includes a host of different services designed to help online business owners with social media management, website creation, SEO, blogging, landing page creation, and even marketing automation. Though it might take you a while to get to grips with all of the different features available on HubSpot, once you’ve gotten to the bottom of your new tool, you’ll find that there’s no stone left unturned. If you’re just starting your business or the first time, it should help to have all of your marketing solutions organized into the same dashboard. That way, you won’t have to log into multiple tools at once when you’re building and managing your campaigns. As we mentioned above, in the modern marketplace, social media is more important today than it’s ever been. In fact, regardless of which industry you might be in, or how big your company is, social media marketing is a must-have to keep you connected with your target audience. With HootSuite, you can tap into a range of services that boost your social media engagement and help you discover the true potential of a social presence. For instance, you can identify influencers in your marketing team, and leads for your sales team, and respond to customer queries too. One of the biggest problems that companies face with social media marketing is trying to keep track of campaigns across multiple platforms at once. Fortunately, HootSuite makes omnichannel marketing easier, by allowing you to schedule and manage posts on more than 30 channels. One of the easiest ways to make any digital marketing strategy more effective is to measure your results and track your campaigns. The more you know about your online performance, the more you can adjust your actions to generate the best results.Google Analytics is a free and simple solution for people who want to find out which parts of their campaigns are successful, and which aren’t. It takes minutes to set yourself up with Google Analytics, and you can use the tool to track everything from where your traffic comes from, to how your conversions are doing. Not only does having more data about your marketing plan help you to adjust future marketing strategies for better success, but it can also help you to demonstrate the success of your business to potential buyers and brokers if you plan on selling. The key to success with Google Analytics is installing it on your website as early as possible, so you can start to gather as much data as possible. The information you collect will be extremely valuable in the long-term. Finally, BuzzSumo is a tool with a fantastic reputation online. When you’re starting a business or trying to get the most out of your digital strategy, BuzzSumo can be a fantastic way to learn more about your target market. Although you probably know quite a lot about your industry and competitors already, BuzzSumo lets you dive deeper and find information you can use to your advantage. For instance, you can use BuzzSumo to find out what kind of content your competitors are creating, and which keywords and phrases they’re ranking highest for. This information can come in very handy when you’re creating content for your blog, and you need some extra inspiration. BuzzSumo can give you an insight into the content that’s performing best in your niche, so you can build strategies designed to capture the attention of your target audience, and drive conversions. Even if you’re just getting started in your solo online marketing plan, BuzzSumo should help you to stay ahead of the curve. With the right tools, even a one-person marketing department can have all the functionality of a complete advertising department. In a world where 60% of any marketer’s time is devoted to digital marketing activities, the right tools will help to make your business more efficient, valuable, and successful. Just a handful of the tools above could be all it takes to help you find your ideal audience, get ahead of the competition, and set yourself up for long-term success. Bio: Ever since he acquired his first company at the age of 19, Jock Purtle has been developing his knowledge as an avid entrepreneur. The founder of DigitalExits.com, Jock is an industry leader on valuations for high-growth internet companies, and he’s been quoted on a number of impressive publications, including Forbes, Business Insider, and Entrepreneur.com.